The latest forecast from analyst Gartner predicts that more than $1.3tn in IT spending will be directly or indirectly affected by the shift to cloud by 2022.Cloud-based system infrastructure spending is expected to double from 11% now to 22% in 2022. With more and more software being provided via the cloud, some may argue that the role of the software asset manager is set to get a lot easier. Strictly speaking, their job will become a whole lot more challenging. There is a myriad of subscriptions available on most IaaS, SaaS and PaaS products, which means it is necessary for the IT asset manager to juggle the different needs of users with the types of products available. While not everyone needs a full version of AutoDesk, Creative Cloud or even Office365, the different tiers of subscription need to be teased apart to ascertain which meets user requirements and offers the best value for money. Given that developers are being encouraged to use their own tooling and will often download a free trial, this free tool can easily become an expensive acquisition if it is put into a production environment. In the cloud, they may run virtual machines, and forget to switch them off or not remove them once the project is complete. There is a cost involved and the software asset manager must somehow work with giving developers freedom and flexibility, with an effective way to audit what exactly is being used on-premise and in the cloud, and what is no longer being used. Similarly, SaaS gives line of business managers freedom to buy their own software with the need for central IT control. But unless there is central software asset management for these SaaS products, no one has oversight of exactly how many subscriptions exist across the entire company, to determine if a better subscription package could be negotiated. AJ Witt, an analyst at the Itam Review believes this lack of oversight can lead to costly errors. He said: “Your internal costs are high and there is 30% wastage.” In his experience, this occurs when a business buys a cloud subscription bundle and then delays deploying all the subscriptions it acquired. 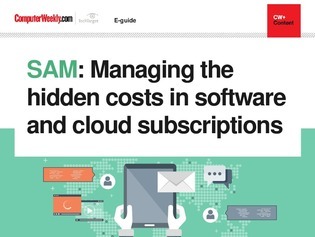 Some of these subscriptions may never get used, leading to wastage in terms of the number of cloud subscriptions. SAM is just as important when applied to commercial open source software. While open source is not sold as a licence per se, businesses tend to pay for support based on the size of the deployment, such as by user. This is similar to user-based licencing, and, if not tightly managed, can lead to considerable costs.